To source fruits for our Business Innovation Project, we set out to rural Bucerias. We had no known destination in mind; we simply began driving towards farmland, stopping when we saw people. Aside from buying fruits, our goal was to create connections and gain some knowledge about the fruit production process. We stumbled upon two farms during our two-hour excursion. I’m not sure where the first farm was. After a long day of work in the sultry Bucerian climate (albeit in an office), I had fallen asleep on the car ride, waking to the coo of birds. I think Jorge, our project leader, had only stopped because he saw people on this farm. I had no idea what to expect. Two middle-aged men along with a huge turkey (see photo below) immediately greeted us. They were darkly tanned with rough hands. It was clear that they were the laborers of the farm. Jorge began to speak to them about our project, and the farmers were eager to converse. They told us about the local produce grown in the area, the seasons for different fruits, and how monsoon season was imminent so farmers were slowly minimizing their outputs. They directed us to where we could find farms for the fruits that we were looking for. Their friendliness stood out to me. Aside from the time and information that they kindly offered us, they showed us around, naming the countless variety of birds they had on their farm. We took pictures on their tractors and explored the area. It was a pleasant interaction that made stopping at a random farm to talk about fruit production seem like not a weird thing to do. The second stop was at a mango farm. 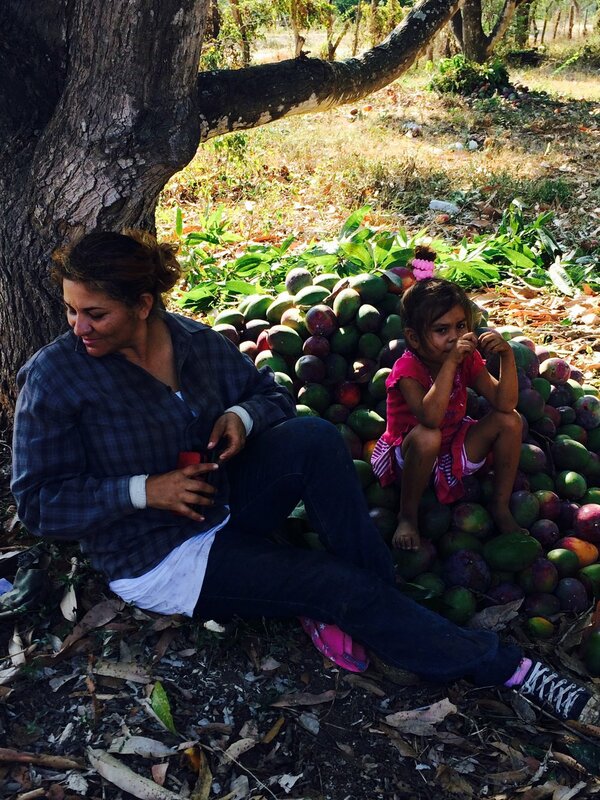 Entering the farm, we saw a child sitting on a pile of mangos next to her sleeping mother, likely exhausted from a long day of work. Men were about climbing trees with long sticks to pluck the mangos. Seeing us from above, two men climbed down from the trees and greeted us. They immediately offered us some of the mangos they had been picking. For the next thirty minutes, setting their work aside, they eagerly shared their knowledge of mango farming and where their products would go next. It was valuable information for our project. This story of the kindness of farmers encapsulates my experience of the welcoming and kindhearted nature of the people of Bucerias through my first week. Their warmth continues to astound me. When seemingly they have nothing, they continue to offer the little that they do have. It is a joy to work with such people.